Once wild, cereals were domesticated by humans starting in the Middle East and ranging to the Alpine slopes. To earn their daily bread, mountain peasants simply used the natural conditions. An example of the capacity of plants to adapt to humans. Or is it the other way around ? Certain plants, arriving from distant lands and clearly different in nature, underwent a long period of integration in the Alps. Though corn, rice and potatoes are today considered typical products in mountain regions, their naturalisation took place through a slow process of assimilation in the local cooking traditions. From the heights of Mount Olympus to the trails of Mount Parnassus, the ancient Greeks ventured into the realms of the gods to exploit their resources. A Hellenic garden, rich with rare wood, wild berries and medicinal plants. This rich harvest was inspired by Martin de La Soudière, a frequent traveller in the mountains. 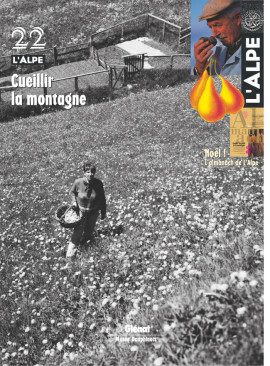 An almanac quite in the style of L’Alpe, a « simple lesson in passing events that nonetheless harbour some of our most lasting happy moments », says Pierre Lieutaghi, a marvelous observer of the seasons who wrote L’herbe qui renouvelle and La plante compagne, two admirable books by one of the most intuitive ethno-botanists. The almanac starts on 1 January announcing the victory of light over the shadows of winter. In the Mediterranean Alps, delicious spices and berries are to be found along each trail. A wonderful source of food that former generations harvested with relish. The inhabitants of the Roya valley, very knowledgeable on the subject, have made great use of them since time immemorial. In the Valais as elsewhere, old-fashioned medicines are slowly fading into the shadows. But to counter their abusive exploitation, a renewed awareness of plants and their uses could serve mountain economies well. A call for a revival of a local herb trade. In the good old days in the Alps, truffles could be widely found peeking out of the underbrush and as savoury ingredients on local markets and in family meals. Following the rural exodus, the sources dried up and the wonderful mushroom became a luxury product. Forever ? Apples, pears, strawberries and co. are an integral part of the Alpine landscape. Growing in hedges or orchards, fruits have always been a staple in diets and contribute to the economy of certain regions. A rich heritage with many very old varieties that must be saved from oblivion. The Queyras and its inhabitants in the present tense. For more than two years, Pierre Witt immersed himself in the upper regions to capture their soul. A tribute to the inhabitants on the high, in the finest tradition of humanist photography with a colourful text by Marianne Boilève. Excerpts. See, touch, smell, learn and understand plant life while strolling in a green heaven. Fun and informative, the five gardens in the Salagon priory, in the Haute-Provence department, offer agreeable walks, each on a different theme. An intimate approach to ethno-botany. Similar to the gathering of berries, hunting was long a means to complement the daily bread of mountain folk. An integral part of Alpine culture and imagery, the techniques varied from one valley and one village to another. Today however, no one goes out to shoot a marmot or hunt wildfowl. Now thoroughly protected, Alpine hunting has lost its originality. The new Grappa has arrived. In the coils of their instruments, creative distillers from the eastern Italian Alps have achieved a tasty transformation. The rustic marc brandy of old has become a subtly aromatic nectar. A most successful combination of new savours. Slow Food is something different among the activist groups in favour of bio-diversity in food. Founded in… France some 14 years ago, this… Italian group never succeeded in making a name for itself in the country of José Bové and the 365 different cheeses. But the year 2003 could well be the turning point in its development. The meeting point of many roads leading to Italy, the valley is exposed to a multitude of influences. Over time, its inhabitants have created a rich culture that is visible on the stone walls and in the baroque styles. A discreet and preserved region that must be discovered step by step, along trails of art and bountiful nature. The next edition of the Grenoble Jazz Festival will welcome the Instabile Orchestra Italiana to render an impassioned and « unusual » musical version of Napoleon, the classic silent film from 1927 by Abel Gance, in which the soon-to-be emperor crosses the Alps. Singing her melodies in the Valais dialect, Laurence Revey, in a stunning geographic carambolage, delicately fuses the Swiss summits and mountains from afar, the texts of Swiss storyteller Claudy des Briesses and the musical inventions of Hector Zazou, traditional instrumental rhythms and the daring tempos of sound wizard Bugge Wesseltoft. A true discovery.